Ending Spending, Inc., a politically active nonprofit founded by members of the Ricketts family paid its president and general counsel $2.895 million in 2017, according to a tax return obtained by Citizens for Responsibility and Ethics in Washington (CREW). The compensation for Brian Baker, who is a political advisor for the Ricketts family, which also co-owns the Chicago Cubs, marks a 572 percent increase from 2016, when he was paid $430,886. The significant increase in salary for Baker came in a year when Ending Spending’s revenue and expenditures both saw significant drops. In 2017, the group raised $1 million, compared to $11.1 million in 2016, and spent $5.4 million compared to $7.5 million in 2016. Ending Spending’s payments to Baker in 2017 are so large that they actually exceed the total compensation the organization has reported paying him since its founding in 2010, according to an analysis by CREW. Based on the organization’s prior tax returns, Ending Spending paid Baker $2.812 million in salary between 2010 and 2016, about $83,000 less than Baker was paid in 2017. According to Ending Spending’s 2017 tax return, Baker’s major boost in salary wasn’t the result of a bonus or incentive pay, but was an increase in his base compensation. The pay raise appears to have been approved by Ending Spending’s sole board member, Joe Ricketts, the billionaire founder of TD Ameritrade. On the return, the group states that “compensation paid to officers/key employees of the organization was reviewed and approved by the independent, non-interested board of directors.” In previous years, Joe Ricketts’ son, Todd, also served on the board, but he is not listed on the 2017 return. He stepped away from the organization presumably when President-elect Trump announced his intention to nominate Ricketts to serve as Deputy Secretary of Commerce in late 2016, leaving the elder Ricketts as the only listed member of Ending Spending’s board. Todd Ricketts withdrew his nomination in April 2017 amid difficulties gaining approval of a divestiture plan by the Office of Government Ethics. In January 2018, he became the financial chairman of the Republican National Committee after casino magnate Steve Wynn stepped down amid sexual assault allegations. Ending Spending’s 2017 payments to Baker were by far the group’s largest expenditures of that year, accounting for 53 percent of the group’s overall spending. The group also reported spending nearly $1.3 million on political activity, accounting for nearly a quarter of the group’s total expenditures. 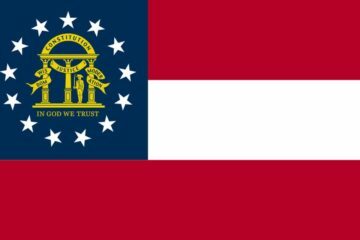 That number aligns with the information Ending Spending reported to the Federal Election Commission for spending on independent expenditures in the 2017 special election in Georgia’s sixth congressional district. Beyond Ending Spending’s efforts in the Georgia special election, it’s unclear what else the organization did in 2017 that might explain the giant leap in Baker’s compensation. The group handed out $135,000 in grants to groups like the National Rifle Association, the Republican Attorneys General Association, and American Policy Coalition, but Ending Spending’s 2017 grantmaking efforts were miniscule compared to 2016 when the group doled out more than $2.5 million to more than a dozen different organizations..
Ending Spending’s web presence doesn’t offer any clues either. 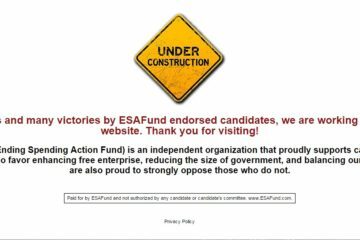 Since early 2017, Ending Spending’s website has been essentially blank but for a message that a new website is under construction. The group’s last tweet was posted in November 2014 and its Facebook page hasn’t been updated since July 2014.